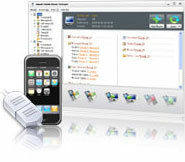 Xilisoft Mobile Phone Manager acts as ideal PC freeware for mobile phone data management, which can synchronize your mobile phone with PC to access mobile data and realize phone data transfer, restoration, copy and other mobile managements between your computer and phone. This mobile manager works well with mobile devices running Windows Mobile. 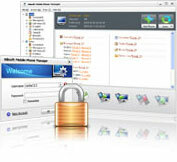 Moreover, Xilisoft Mobile Phone Manager allows you to create your own account to protect phone data. With this mobile manager, you can load your contacts from phone, read messages and E-mail, edit contacts, add calendar and tasks, view notes and favorites. As phone data transfer, Xilisoft Mobile Phone Manager can also connect and communicate with more than one phone. And the connection can be done via cable and Bluetooth. Now, with this free mobile manager, you will have a possibility to enhance your PC into a mobile world and your mobile data will never lose again. 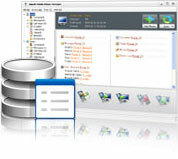 Backup data and restoreXilisoft Mobile Phone Manager enables you to backup important phone data and local data on PC. In case that your mobile is lost or stolen, you can recover all backup data to your new device. Phone data copyWith this phone data transfer you can copy your phone contents between PC and phone, or from one phone to another (e.g. from Nokia to Motorola and vice versa). Sync for all entry typesSynchronize contacts, messages, E-mail, calendar, favorites and tasks with PC. Besides, this powerful mobile manager allows you to exchange data with MS Outlook. Manage account for data securityCreate your own account to prevent your important data from stealing, deleting incautiously, copying or any unauthorized use as your data safeguard. Identify deviceAutomatically show your phone info including phone model, image, name, phone capacity, SIM card capacity and Operator. Organize your phonebookWith Xilisoft Mobile Phone Manager, you can read, modify, write the phonebook, create new contact, set individual contact picture as much detail as possible. Manage calendar and tasksXilisoft Mobile Phone Manager lets you record your every calendar and task. With the reminder applied, you will never miss any appointments, meetings and tasks. View messages and calls on PCThis easy to use mobile manager allows you to view and read inbox, outbox, drafts, sent items, received and missed calls, call history, and display basic message info. Take your E-mail with youThis great phone manager provides the ability to manage more than one E-mail account, read and delete E-mails. 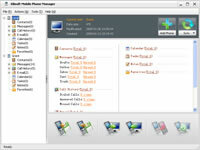 Connect multiple phonesSimultaneously connect one or more phones to Xilisoft Mobile Phone Manager and manage device content effortlessly on your PC. Connection typeSupport USB cable and Bluetooth to establish a connection between your phone and the PC. Detect several phones simultaneouslyNo matter the phones connected by USB cable or Bluetooth, this mobile manager can find and connect them instantly regardless of connection type. Support various phone modelsXilisoft Mobile Phone Manager gets full support for different models of phone and smart phone. 3GP video converter, convert formats including MOV, RM, AVI, WMV, MPEG to 3GP, 3G2 and MPEG-4. Rip and convert DVD to 3GP video format and 3GP audio formats MP3, AAC, M4A fast. Convert video, convert most popular video and audio formats to another. Copyright © 2004-2010 Xilisoft Corporation. All rights reserved.